I'm sorry, but I'm away from the blog at the moment. I'm on my way here. If you leave a message I'll probably get back to you in a week. Unless your message is mean-spirited and envious because I'm in Jamaica. Then I'll ignore you. 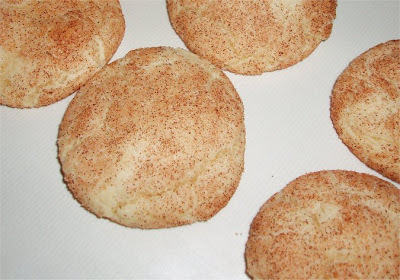 Snickerdoodles are a kind of sugar cookie. They're easy to make, chewy, light, cinnamon sugar things. I made them because I had everything I needed in the house. My recipe is from the Pillsbury Kitchens Family Cookbook 1979 edition. Heat oven to 400 degrees F. In large bowl, combine first 4 ingredients; blend well. Stir in flour, cream of tartar, soda and salt; blend well. Shape dough into 1-inch balls. Combine 2 tablespoons sugar and cinnamon; roll balls in sugar mixture. Place 2 inches apart on ungreased cookie sheet. Bake at 400 degrees F. for 8 to 10 minutes or until set. Immediately remove from cookie sheet. On Thanksgiving I cook for friends and family. But sometimes, on a chilly fall evening, I just do something for Bob and me. I meant to take a picture of this before we ate it but I forgot. 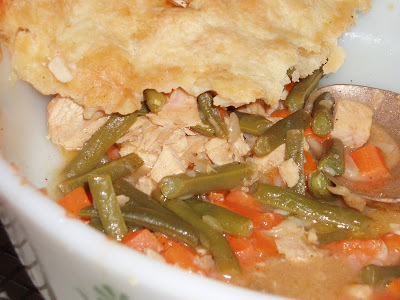 I took our leftover turkey and made a turkey pot pie. I read Michael Ruhlman's The Making of a Chef about the training at the Culinary Institute of America. In the first real cooking class the students take, Skills I, they start with the classic French sauces. Ruhlman becomes obsessed with a particular sauce, the most basic sauce of sauces, the brown or espagnole sauce. Making the sauce starts with a brown roux. 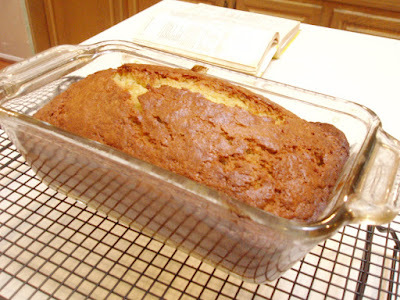 Flour slowly cooked in butter until it is a nutty brown color. The classic espagnole sauce then adds veal stock, vegetables and tomatoes. I was thinking a lot about the roux. I've never made a brown roux. Walter Jon Williams routinely makes a black roux for his Black Roux Gumbo (it's actually a very dark brown roux because the technique requires that the roux come right to the edge of scorching and then stops) but me, I just never have. I also decided I didn't want a pie crust for my pot pie. So I made a pate brisse, a French pastry crust with butter used as the shortening which is shorter and richer than the traditional pie crust. I blanched and shocked my green beans. Then I sauteed my onions with garlic and added some carrots. I put that aside. Then I made my roux. I did not go all the way to dark brown, but I did get a good amount of nutty browness, then added my turkey stock from yesterday's turkey carcass. I splashed some Riesling, cooked it to thicken a moment, then put my vegetables and some chopped roasted turkey meat in it and poured it in a baking dish. Then I plunked my rolled out pate brisse on top and baked it until the crust was golden brown. Served it with a salad and cranberry sauce and it was a pretty good use of leftovers. The family found it tasty and comforting. Nothing about it suggested that it was a recipe arising out of my obsession with cooking technique. I liked the whole idea a lot, that you could come to my house and have this pot pie that was just like a frozen pot pie except it was really really good. You wouldn't know it was good because the base was a French roux of butter and flour, or that cooking the flour until it is brown cooks out the 'floury' taste and creates a kind to nutty flavor that adds a bit of sweetness and richness. You wouldn't know that I used a rather dry Riesling and that just a taste of that added complexity to the gravy. You wouldn't know that I blanched the green beans so they would cook enough but still have some greeness in their taste. You wouldn't know that the crust on top has to be made in stages because the butter has to be kept cold. Not as touchy as puff pastry, but headed in that direction. 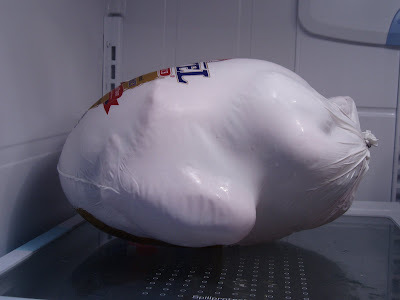 Turkey is the exotic protein in American diets. We pretty much eat muscle of three animals. Cows, chickens, and pigs. No organ meats. Not even a particularly large range of muscle meats (we tend not to eat much of the tougher cuts of meat that require slow cooking, but have more flavor, unless we grind them up into patties.) And pork is getting more and more marginalized. We probably eat most of our pork as ham bacon or sausage. Maybe the occasional pork chop. We didn't used to eat that way. But we don't do that anymore. I suppose part of the reason is that chickens and pigs lend themselves to factory style agriculture. I don't know why we have such a huge beef industry. It seems an odd thing, economically. A cow is a pretty good food investment when you can milk it and/or graze it--but we support most of our food quality beef on corn these days. Our meat grows blander. We prize tenderness over taste. Turkey is a good, safe 'exotic.' Especially commercial turkeys, which have relatively bland meat. I know you can buy ostrich and bison these days. I have. But if you stand in most groceries, what you see is a lot of beef, a lot of chicken (broken down mostly into breasts and thighs, with some pre-cut up assortments and some whole birds. What happens to the necks and the backs? Meat is 'broken down' and shipped as parts these days--grocery stores do some butchering, but those wonderful chicken backs that make such good stock aren't back in the back in the grocery.) And you see a smaller area of pork. And then 'poultry--turkey, duck, and cornish game hens which aren't really game at all, they're a small chicken.' Lamb, bison and ostrich are stuck at the edge of the beef/pork areas. We seem to like our meat tender and without too much flavor. Part of that might be because of restaurants--more flavorful cuts of beef, for instance, require a long braising or stewing time, and that's hard to do in a restaurant. Easier to have something you fire on the grill or in the saute pan to order. There's a growing interest in cuts of the animal that aren't steak as well--long braise cuts like beef shanks, pork shanks, ox tails and beef cheeks. And turkey hangs on. Thanks to the recent interest in reducing fat--turkey is very low in fat, the way that chicken used to be before it was bred to be fatter. (Unlike pork, which is being bred to be leaner, to the detriment of its taste.) And thanks, of course, to Thanksgiving. I’ve been thinking about two things recently. One is this quote from The New Yorker about the Brian De Palma film “Redacted,” “None of us particularly want to hear what “Redacted” has to say, including liberals who criticize the war but regard the soldiers as noble victims.” I’d say that I fall into that camp. I actually don’t regard the soldiers as noble. I remember very well from growing up in a blue collar town just who it is who volunteers for the armed services. The kids who went to be soldiers weren’t usually the dregs of adolescent society—the stoners, the thugs, the thieves, the losers. But they were the kids who were low on introspection. I assume that the jarheads I’ve sent packages to are kids. That they will drink too much, become enraged a lot, and that they may not have the intellectual and emotional resources to deal with the experiences that they are having. I assume they are not particularly comfortable with ambiguity—doesn’t the military promise a life where ambiguity is reduced? I fear that the promise they did not consciously recognize was being made, that life in the military will be reduced to clear situations where they will know how to behave and what will be tested is their bravery, is not being kept. I suspect they are up to their eyebrows in the ambiguous, the murky, the demoralizing. They are finding out that they may be brave on a given day, and overwhelmed on another. But I certainly regard them as victims. Which is perhaps not fair. Although a lot of the soldiers in Iraq were in the National Guard and did not volunteer expecting what they got, the full time military is volunteer. If someone chooses to volunteer, it’s hard to argue that they are ‘victims.’ Still, we send young people into war and there is more and more evidence that a majority of 18 to 20 year olds have brains not yet mature and that the areas that are still maturing are the parts of the brain the involve judgment. I don’t think it’s possible to volunteer knowing really what it is like to be in war. When I volunteered to go to China I was 28. I certainly didn’t know what I was getting into. And nobody shot at me. Here’s the other thing I read that I have been thinking about. "At least 120 Americans who served in the U.S. military killed themselves per week in 2005, CBS News learned in a five-month investigation into veteran suicides. That's 6,256 veteran suicides in one year, in 45 states." I read it first via Walter Jon Williams. He links back to the CBS news article. As Tarl Neustaedter points out, “The U.S. overall suicide rate in 2005 was 10.5 per 100,000 - around 30,000. From the figures in the article, it appears that the veteran suicide rate in 2005 was 6256 out of 24.5 million, or a rate of 25 per 100,000. Somewhat over double the civilian rate.” Veterans commit suicide at about twice the rate as the general population. There are a lot of reasons for that—men are more likely to commit suicide than women. Issues of temperament and socioeconomic class. Situational depression and something called ‘kindling’, which is the name for the observation that an episode of depression seems to make the brain more susceptible to depression. And that subsequent depressive bouts come sooner and sooner, and last longer and longer. Which is to say that if someone gets depressed in a stressful situation, like Iraq, they are more likely to suffer depression later than if they hadn’t gotten depressed in the first case, and that each time they get depressed it will be worse. Lastly, I’ve been thinking about Vietnam. It was the backdrop of my childhood. Walter Cronkite and Vietnam. A strange cultural phenomena, that. It turns out that it’s very difficult to find any evidence that soldiers were spat on when they got home. But it is true that the public’s reaction to the war was tempered by My Lai and that there was a profound distrust of soldiers. 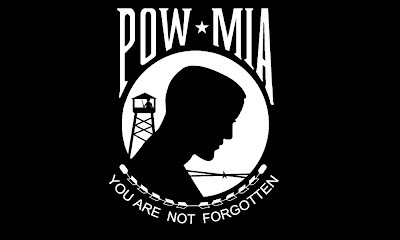 Except the symbol of the Vietnam War is probably the POW/MIA, again, the soldier as victim. We are a different society from almost all other societies historically in that we do not view war as a right of passage, as a crucible to create great men, but as a potentially, perhaps certainly damaging event in a young man’s life. Even our analysis of World War II is changing to reflect this view. It makes it harder for us to fight a war. I certainly hope it’s a view that infects other societies. It tops Christmas. 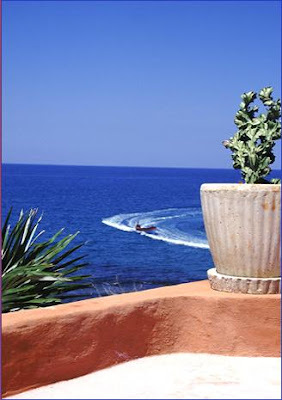 I've been thinking about holidays--and I plan to post a rant about them on Eat Our Brains tomorrow, about how holidays have become a kind of financial and emotional marathon. I supposed for some people, Thanksgiving is a holiday that fills them with apprehension. There are lots of articles about how to cook for Thanksgiving without losing your mind. For me, the cooking part is not a big deal. And once that expectation is removed, Thanksgiving is a holiday of low or no expectations. Christmas is fraught with expectations. As is Valentines Day, and increasingly, Halloween. But Christmas most of all. They were putting Christmas decorations up in the seasonal aisle of the grocery on November 1. Pulling bags of candy and replacing them with Christmas ornaments and St Nicks. (The seasonal aisle is the aisle of the grocery where in the summer you can find plastic plates and cups, squirt guns and sunblock, in August that is replaced by back to school stuff. At Easter, it's where the Easter baskets and candies are.) November 1 to December 25 is almost two months. 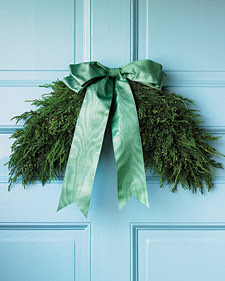 Two months to worry about making a clever wreath out of a coat hanger (above) and the $10 gift exchange at work. Nobody ever says, 'This is the best Thanksgiving, ever.' Thanksgiving doesn't work that way. Thanksgiving is sort of like a Sunday family dinner just made bigger. Thanksgiving is the holiday where people travel the most. More than Christmas because for Christmas you have to schlep all those presents. Thanksgiving, you can just get an over-priced airline ticket and be somewhere. You sit around, eat and talk. People watch TV. There isn't an aisle of the grocery store devoted to Thanksgiving paraphernalia, just a couple of towers of aluminum foil roasting pans and a stack of tacky autumn-themed platters. I worry though. Places like Crate & Barrel are telling me how to do an Eco Friendly Thanksgiving. I have no problems with the concept of eco friendly, but when it's sold to me, I can see the thin wedge of commercialization creeping in. Pretty soon there will be rituals growing up around Thanksgiving. These rituals will involves more than buying a turkey and a can of cranberry sauce. They'll probably involve annoying hostess gifts, or special tableware or something. But this Thanksgiving I'm going to have an Orphan Thanksgiving. I've invited people who, like me, are relatively new to Austin. We'll eat, sit around, watch TV. It will be low key. It will be great. The Adopt a Marine program is going really well. I've given out 35 names and addresses from my list of 70 Bravo Company guys. People often ask me what to send. Here's what I'm sending in my next box. 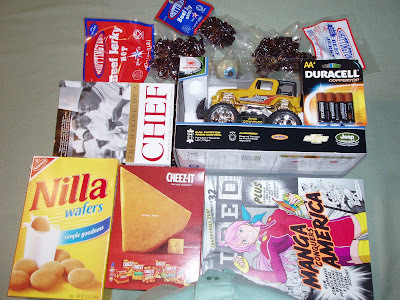 A remote controlled car and batteries, a box of vanilla wafers, a box of Cheez-its, a couple of wired magazines, a book called The Making of a Chef and three packages of jerky. Jerky and Red Bull are among the most requested items, along with Baby Wipes and hand sanitizer. (I asked Jason about the Baby Wipes and he said Baby Wipes would be great because in the field there's no way to get clean. But I forgot to get them for this box. Next box.) I bought the jerky in Fredericksburg, Texas yesterday and when I put the two packages on the counter, I said, 'These are going to Iraq.' The guy running the store immediately threw the third little package in for free and said, 'You tell them we're thinking of them. You tell them we care." The one thing I know they want that I won't send is cigarettes. It seems foolish to worry about smoking when they're getting shot at, but I can't quite bring myself to put a carton of Marlboros in a box. Jason says that magazines are probably a little better than books. Some of the guys read books, but everybody likes a magazine. I'll be pleased to get this one off. The post office says stuff is getting there in about two weeks. That means if they aren't on patrol, they've got a good chance of getting there before Thanksgiving. Maybe I should have bought turkey jerky. Lord knows, we have enough Halloween candy that I have no reason to be baking, but the oven is new, the bananas were past ripe. Not baking would have been wrong. Just wrong. 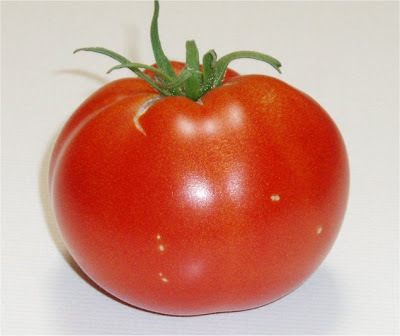 This is a $40 dollar tomato. It is also a memento deficio, which is like a memento mori except instead of using it to contemplate my eventual demise, I can instead just contemplate my shortcomings. Last spring (and spring comes early in central Texas) I decided I would plant some herbs. I drove around until I found a gardening store. People were buying flowers by the SUV load but back in the corner, behind the perennials and the annuals, the day lilies, the pink phlox, the bright yellow of marigold and the promise of the rose bushes, I found vegetables and herbs. I bought thyme, rosemary and basil. Rosemary never really worked very well in Cleveland. Cleveland is one zone too cold for rosemary, which meant that rosemary would last about a year and then a hard freeze would kill it. But here, I reasoned, I could eventually have a real herb garden. Maybe a knot garden. Okay, not a real knot garden, but at least a little decorative herb garden with borders of rosemary and squares of basil, thyme, savory, oregano and tarragon. I bought six rosemary plants, a lemon basil and a regular basil and two different kinds of thyme and brought them home. I planted them. Then Bob and I went for a walk and while we were walking we discovered something. In Texas, rosemary is a bush. I bush that grows several feet tall and several feet wide. It is not a neat little border. Back home I took out some of the rosemary and moved the rest. All this mucking around in the garden got me pondering. I don't like store bought tomatoes. They don't have any taste. When I was a kid, my Aunt Sylvia grew tomatoes in containers on her patio. My Aunt Sylvia lived in California. They had a pool. The one time I went to Aunt Sylvia's, she made a leg of lamb for dinner. I had never heard of such a thing. Their house was different, beautiful. I could only think that if I had a container or two growing tomato plants, suddenly my house, and by extension, my life, might become a little more...interesting. Besides, the place where I had put the herbs was around the side of the house and I knew me, if I didn't see those tomatoes every day, they'd never get watered. So I bought a couple of containers, some potting soil and two heirloom tomato plants. All in all, about $40. I put the plants in the containers. And then it rained. It turns out, if you over water tomato plants in containers, they don't set blossoms and if they don't set blossoms, you get no fruit. And that's what tomatoes are. Fruit. I fertilized. I moved them into the sun. When there was sun. It was the wettest summer on record in over a hundred years. Finally I stuck one of the damn plants in the ground. It was mid-August and in Ohio, there would only be about thirty days left in the season. I have lots of green tomatoes on my tomato plant now. But the nights are getting chilly (we've had temperatures in the 30s.) Still, yesterday I picked my one red tomato off the plant. The photo above makes the tomato look massive, but actually, it's the size of a peach, a little smaller than a red delicious apple. It's the $40 tomato. Later today I will slice it and eat it, maybe with a drizzle of olive oil and some of the basil from the garden. The basil has done great, as has the rosemary and the thyme. Next year, I'm sure the tomatoes will do great. But for now I can contemplate my $40 tomato and recognize that sometimes I get a little ahead of myself. This year I did include in the mix gummy eye-balls. And lo, they were unto the supplicants a great big hit. And the supplicants proclaimed, 'Trick or treat--wow! 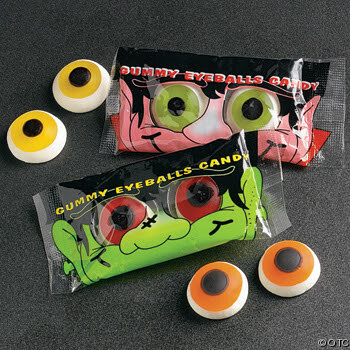 Gummy eyeballs! Those are cool!' And the supplicants did put two items in their bags because this year their numbers were few and of candy there was much. And so they got gummy eyeballs and Milk Duds, if they so desired. When we moved into this house, we found that the oven door didn't quite close which meant that the oven had a draft so the temperature was uneven and baking anything was chancy, at best. And that the controls to the burners had gotten so gummed up that the back burners were hard to adjust--mostly I could turn them on, or turn them off. And that the stove wasn't level, which meant that when I fried something, the shortening puddled at the front of the pan, leaving the back of the pan to scorch. Needless to say, it made cooking less fun. 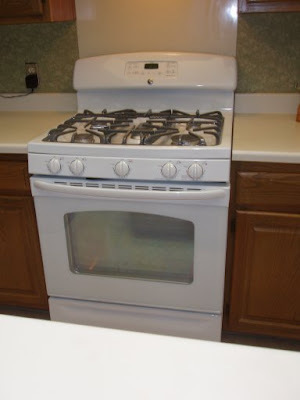 Today they delivered my new stove. Meet GE JGBP86DEM. It has a 17,000 BTU power burner, a elongated central burner with a griddle that fits right in, and a precise simmer burner. Right now it also has a pot of Cheese and Sausage soup simmering on top of it. And it's level, the door shuts, and all of the burners work. 17,000 BTUs baby. Let's see what this sucker can do.